Kabul, Afghanistan (CNN) -- Allegations that NATO-led soldiers desecrated a Quran in a weekend operation against the Taliban spurred an angry protest Tuesday in southwest Afghanistan, authorities said. The protests, which turned violent, occurred in the Garmsir district of Helmand province, according to a statement by NATO's International Security Assistance Force. During the protests, an insurgent sniper shot an Afghan official, the statement said, and ISAF service members then shot and killed the sniper. Armed protesters also attacked a National Security Department office and demanded the release of prisoners, Helmand province spokesman Dawood Ahmadi told CNN. They also torched a school, he said. "While denying these allegations, we take them very seriously and support a combined investigation with local Afghan authorities," said Major Gen. Michael Regner, deputy chief of staff for operations for ISAF Joint Command. "ISAF is an international force that includes Muslim soldiers, and we deplore such an action under any circumstances." In addition to the allegation of desecrating a Quran, Ahmadi said, other reports accuse security force soldiers of violating a woman, and yet others say the soldiers destroyed a mosque. The governor has launched an investigation, he said. 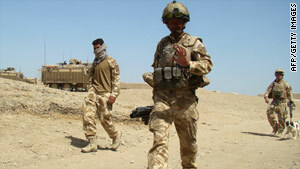 The allegation stems from an operation against the Taliban that ISAF conducted Sunday, the statement said. "Afghan forces conducted the operation, supported by coalition forces. No shots were fired, no property was damaged and no one was detained," the statement said. The demonstration was among several incidents of violence in Afghanistan reported by officials. Four policemen were killed in the Gereshk district of Helmand province Monday night by guests they invited into their post, Ahmadi said. Their weapons also were stolen, Ahmadi said. Delaram district Mayor Abdullah Jan was killed Monday afternoon after he earlier survived two attempts on his life, Nimroz province Police Chief Abdul Jabbar said. The assailant is unknown, police said. And a 25-year-old police officer was killed Monday night when a suicide bomber wearing an explosives-laden vest detonated the bomb while trying to enter Uruzgan province police headquarters, authorities said. Meanwhile, a French soldier wounded Monday in a gun battle with militants in eastern Afghanistan has died, the French Defense Ministry said Tuesday. The soldier had been evacuated to the Bagram military hospital, where he succumbed to his wounds, the statement said. Another French soldier died Monday in the same clash, which took place in the village of Alasay, east of Kabul. There have been 38 French deaths in the Afghan war.